The newly opened Salute restaurant (meaning health in Italian) is all things fresh and delicious. 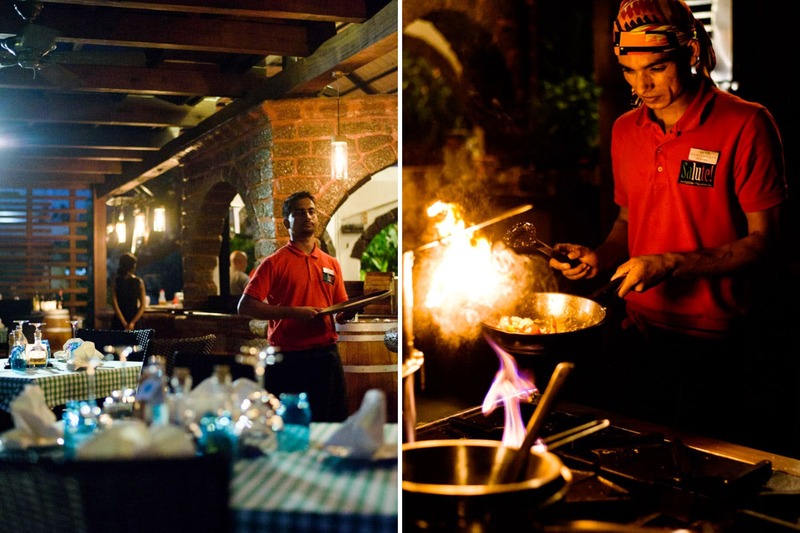 Nestled overlooking the sprawling lawns by the seaside of the Kenilworth Resort & Spa, it not only provides you with a gorgeous view and setting, but also the most delicious Italian food experience in Goa. Where should we start? Everything in this restaurant is made fresh in-house, even their delicious Tuscany bread and the Focaccia which come as part of the bread basket. We sipped on glasses of the wonderful Viognier wine (amongst their extensive drinks menu), while we looked at the view and the open kitchen that had on full display the team at work preparing everything from scratch. Chef Davide Cananzi who helms this place, will come by and happily tell you about the origins of Italian dishes, ingredients and even guide you with which dishes to try out. So off we went with an antipasti platter that came with a lovely selection of cold cuts, cheeses including a delish goat cheese (made locally in Goa), roasted aubergine, salad and warm bread. The prawns that came grilled in a white wine sauce hit the spot for sure. For the main course, we had steamed Norwegian salmon and lasagna that we gorged on followed by the most delicious Gnocchi in a delicious Gorgonzola cheese sauce. And then it was time for dessert, and the selections were equally rich. We recommend the amazing Tiramisu and the pear and almond tart with cherry ice-cream. Not only the herbs, but even most of the veggies used here are freshly plucked from their in-house garden behind the restaurant, the only way to control quality according to the Chef. They also have the most delectable array of pizzas too. A meal here is definitely recommended, and it has the trifecta of great food, ambience and drinks. We wish the place also opened for lunch. As sadly, it is only open for dinner as of now. Hopefully, that might change once the monsoons are over. Plus they will also have tables put up on the lawns once the rains clear. The Gnocchi here is a definite must-have, with the way it is cooked to perfection, that it just melts in your mouth. And so is the Tiramisu here, made using a secret family recipe that Davide inherited from his grandmother back home in Italy.